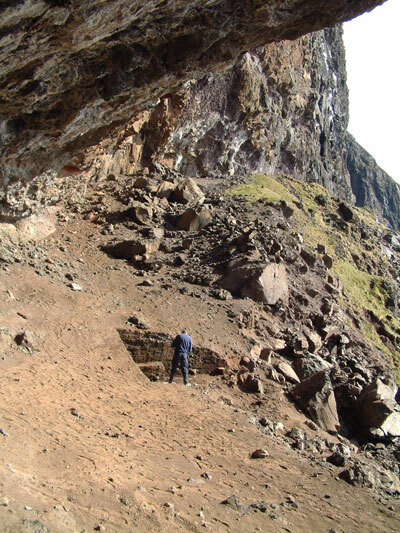 Excavations start at the Cave of the Speckled Horses at Fiskavaig…. 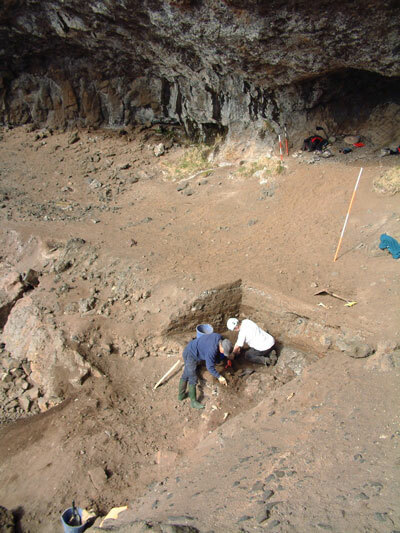 Excavation of Trench 1 at the Uamh an Eich Bhric, or Cave of the Speckled Horses near Fiskavaig on the west coast of Skye, has started today (14th April 2008. Martin Wildgoose had already made a start last week removing over one metre of the overburden that covers the cultural midden, so today Martin, George Kozikowski and Steven Birch, made the long walk out to site weighted down by more equipment! However, the weather was fine and dry after a little overnight snow on the mountains, and we made good progress across the bleak moorland above Fiskavaig. A steep descent down a grass and heather-covered slope soon found us at the base of the cliffs, with this spectacular view (see image below) north to the rock shelter (which is still around 0.5km away). 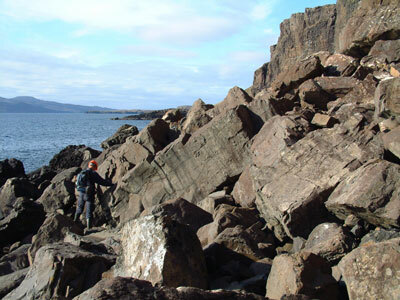 The next image shows Martin scrambling over the boulders at the base of the cliffs, which is quite difficult ground. Note the use of an hard hat - just in case any stones fall from the cliffs above!! Martin had already marked out the trench, had taken levels on the surface and had also removed around one metre of the sterile overburden from Trench 1 over two days last week. These deposits comprised wind-blown dust, layers of rock breakdown from the cliffs above and degraded sheep droppings, but no cultural material. 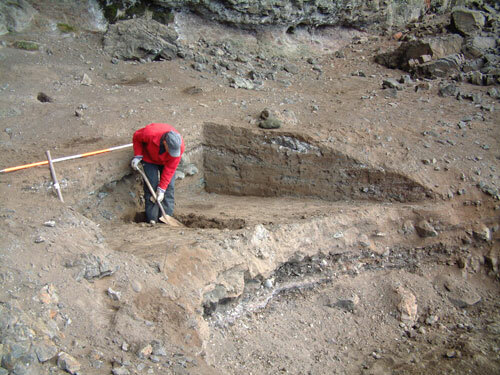 The image above shows another view of Martin working in Trench 1. The dark layers of the cultural midden can be seen in the eroded face below. We had to be careful as we removed the final sterile deposits from above the cultural material and as the first signs of charcoal, bone and shell appeared, we changed from digging with spades to our hand-trowels and brushes. Midden deposits appeared to be running up against larger boulders that lay within the cultural material, so we left these in place and cleaned down to reveal fine layers of ash and charcoal, through which animal bone, shell and fire-cracked stone could be seen. The image below shows Trench 1 from the N after we had finished the first clean down to the abandonment layer in the midden, in this part of the rock shelter. Some of the larger boulders can be seen in the trench with areas of charcoal and ash lying in pockets between. 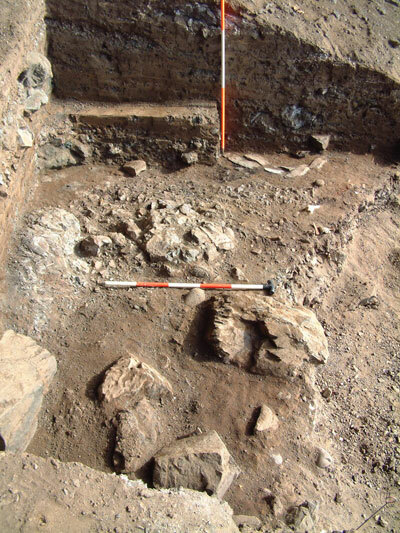 At the far end of the trench, we have uncovered our first feature - a square or rectangular slab-built hearth setting. 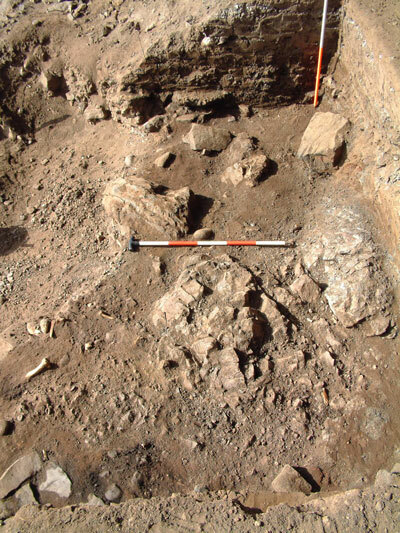 This feature is partially covered by the deep sediments of the S baulk of the trench and it is surrounded by fragments of animal bone, fire-cracked stone, charcoal and ash. 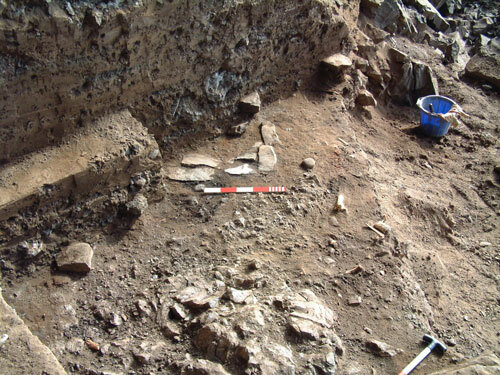 Further excavations will take place around the hearth and between the larger boulders in the trench, so that we can investigate these various relationships and contexts. We will also be sampling these deposits, and these residues will be submitted for further analysis by specialists. The discovery of the hearth within Trench 1 has provided a great start to our excavations and while there were few finds from the trench today (a bone spatula), we should excavate into more complex midden deposits tomorrow. We finished the day by recording in plan the features in the trench representing the last use of the rock shelter. 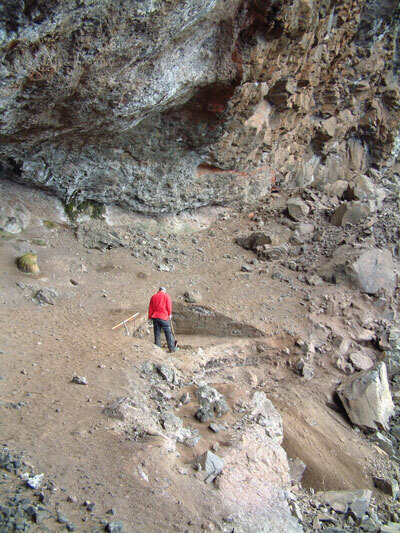 The image below shows Martin recording in the trench, looking out from the back of the rock shelter. 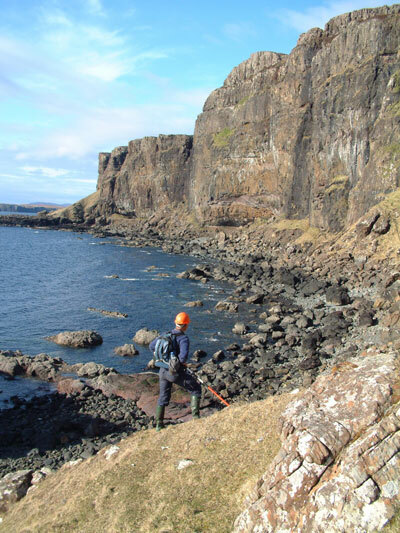 The remaining part of the huge talus of boulders and sediments can be seen beyond, with the cliffs looming above. Finally, at around 6.00pm, we started our long walk back out to the road-head. 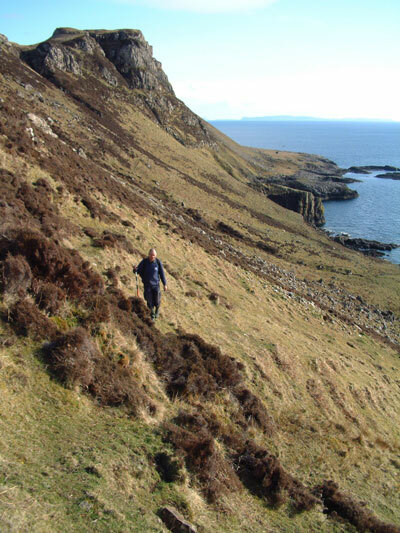 The image below shows Martin climbing the steep grass slopes to the top of the cliffs; always a tiring part of the day! !